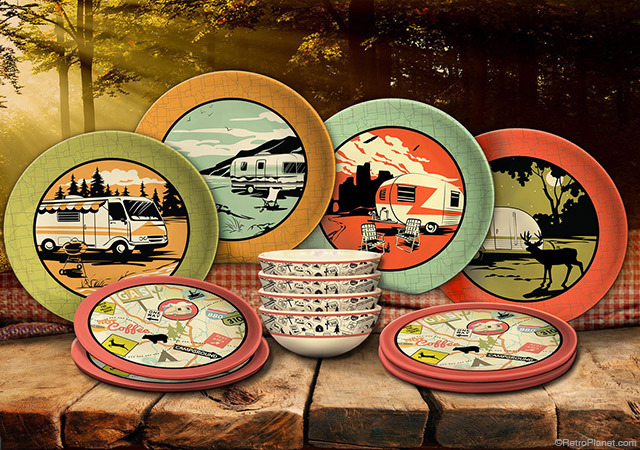 We recently added a new product line for all you RV and outdoor enthusiasts that will become your favorite traveling companion: Melamine dishes and bowls from Camp Casual! Go camping or tailgating in style with the Camp Casual melamine dish service for 4. Made with mobile folk in mind, these retro style camping dishes are durable, easy to clean and come in gift boxes with handles for easy transport. Whether you’re RVing, tailgating at the football game or out for an afternoon picnic, Camp Casual dishware will make you forget all about flimsy, messy paper plates. 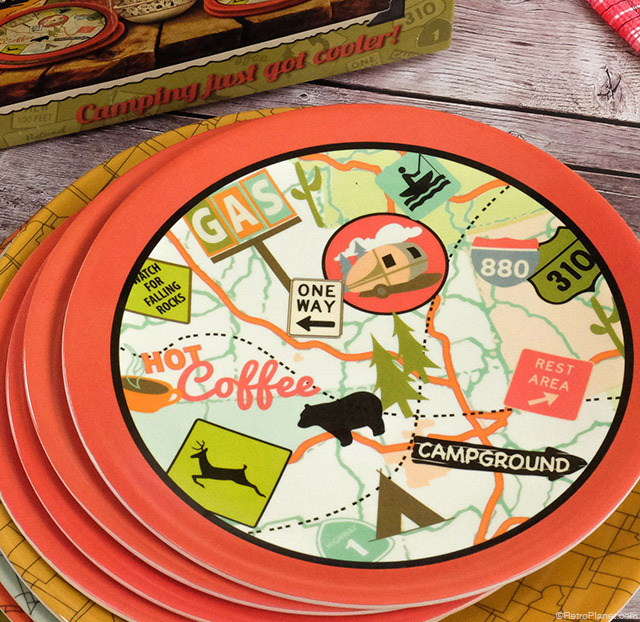 Every piece features nostalgic RV-themed graphics, with campers, animals and tourist map patterns. Choose from two sets: a 12-piece dish set, and a five-piece place setting just for the kids. The 12-piece set includes four place settings, each with a dinner plate, a bowl and a sandwich or salad plate. The kids’ set includes a plate with divided sections, a bowl, a cup, a fork and a spoon. The 12-piece set includes place settings for 4 people; 4 dinner plates, 4 luncheon plates and 4 bowls. More than a business, Camp Casual is a labor of love for co-owners and sisters Rosie Hirsch and Cheryl McCarthy. Their father was in the RV industry, so they literally grew up in motor homes. According to the company’s website, the sisters’ goal is to bring “re-imagined retro inspired items to RV and camping enthusiasts everywhere.” Mission accomplished! 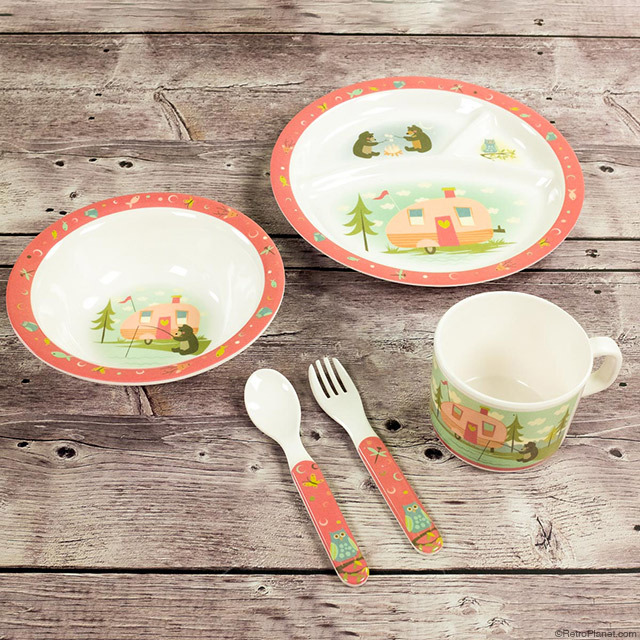 Kids can enjoy outdoor dining, too with this whimsical camping dinner set! Cool retro details celebrate camping at its best. Seeing these designs reminds me of our family vacations in North Carolina back in the 70s (Uncle Jack loved to fish on Ocracoke Island) – setting up the camper, catching crabs, playing cards by lantern light. Being the youngest, I had the honor of digging the fish carcasses out from under the trailer where the dogs had buried them. Yeah, fun times! 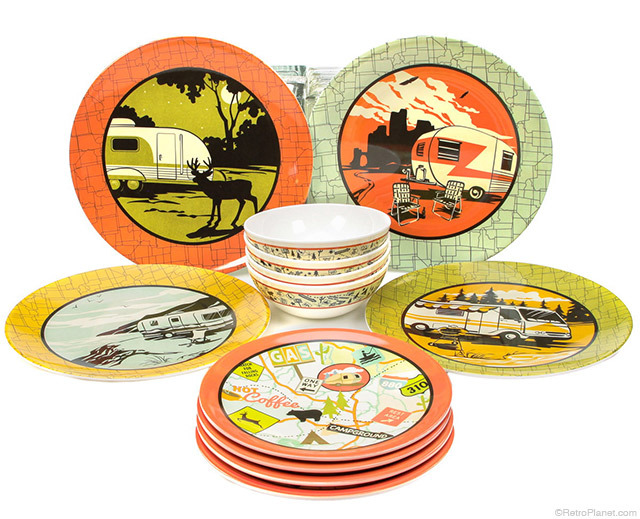 Take a look at these fun RV dinner plates, and other outdoor-themed items, in our Cabin section.